We build every Toyota car, truck and SUV to exceptional standards. Then we go a step further to support you and your vehicle with these comprehensive limited warranty coverage. If you are searching for new Toyota cars in Los Angeles, you will be able to come across many great deals on solid cars that will last for many years. Every Toyota is supported by a 36 month/ 36,000 limited coverage warranty with coverage for all components other than normal wear and maintenance items. Your Toyota dealer offers vehicles that will also come with 60 month/60,000 mile powertrain coverage to include the engine, transmission transaxle, front wheel drive and rear wheel drive system. Each vehicle also comes with rust-through coverage for 60 months/unlimited miles for corrosion perforation of sheet metal. New Toyotas also come with emission coverage that can vary under the Federal and California regulations. Each vehicle will come with an applicable Warranty and Maintenance Guide booklet for details from the Toyota dealership. 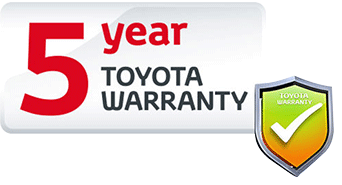 The TCUV warranty (Toyota Certified Used Vehicle) ensures that each vehicle that comes to Toyota dealerships is put through a 160 point quality inspection, as well as being backed by the 12 month/12k mile Limited Powertrain Warranty from original date of first use when purchased as new. There is an added roadside assistance program for 7 years/100,000 mile, 24 hour Roadside Assistance program for even more vehicle satisfaction. For even more enhanced peace of mind, consider the Extended Vehicle Service agreement available through Toyota Financial Services, and if you have questions, you can ask about it at the Toyota dealer. Toyota is world-renowned for their hybrid vehicles that have met the standard for technology, efficiency, and drivability. The vehicle itself is outstanding, and the warranty should be, as well. 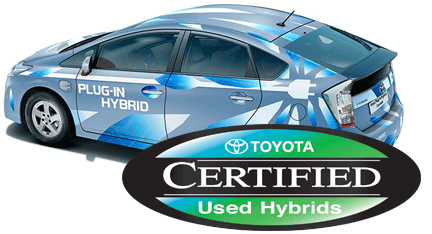 The new hybrid warranty covers hybrid components for 8 yr/100k miles or 10 yr/150k miles in CA. The hybrid vehicle is unique in its own needs and has hybrid related component coverage; your Toyota dealership knows this. This includes hybrid-related components like the HV battery, battery control module, hybrid control module and inverter with converter that is covered for 8 years/100,000 miles. The HV battery may have longer coverage under emissions warranty information available in the details book. Powertrain coverage will last 60 months/60,000 miles, to cover the engine, transmission transaxle, front wheel drive system, and rear wheel drive. Rust-through coverage is provided for 60 months/unlimited miles, including corrosion perforation of sheet metal. Genuine Toyota Parts bought through the Toyota dealerships are built to the highest standards of quality, durability, and performance. Each has 12 month coverage and not many other companies offer a longer guarantee. If you purchase the accessories at the time of the new vehicle purchase, the Toyota Accessory Warranty coverage is in effect for 36 months/36,000 miles from the vehicle’s in-service date. This is also the same coverage as the Toyota New Vehicle Limited Warranty. If you purchase the accessories after the new vehicle purchase, the coverage is 12 months, regardless of the mileage. It covers the accessory from the date it was installed on the vehicle of any applicable new vehicle warranty, whichever is greater, to exclude car covers. Car covers are warrantied for 12 months from the purchase date, and no coverage is assumed under the Toyota New Vehicle Limited Warranty.